The school and the Parents Association send sincere gratitude for the generosity of the Pacific Ridge School Community! Numerous donations resulted in the delivery of a large volume of clothing, shoes, accessories and toiletries to Veterans Village of San Diego for immediate use to assist homeless veterans and their families. 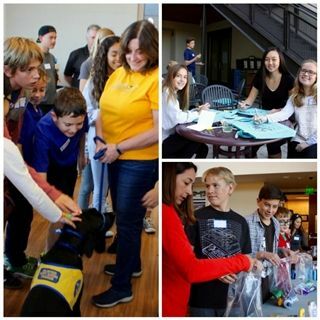 A big thank you also goes to the enthusiastic middle school families who not only packaged the items for Veterans Village, but also decorated 50 tote bags and filled them with donated dog treats, toys and care items for Canine Companions, as well as a personal thank you note, which will be distributed to veterans and their service dogs throughout the Southwest region.